The limit for the Earth Continuity Test is (0.1 + R)Ω. Where the ‘R’ value is the resistance of the protective conductor (earth wire) within the supply cable. In practice when PAT testing, measuring the actual resistance of the earth wire within the cable is impractical, therefore the ‘R’ value is usually calculated using Table V1.1 in the IET Code of Practice. 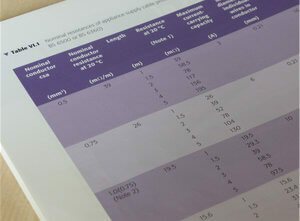 Table V1.1 in the appendix of the IET Code of Practice, page 134, gives the nominal resistance values for a variety of cable sizes and lengths. The resistance values are in mΩ (milliohms), so need converting to Ω before using the (0.1 + R)Ω formula. Our simplified version of the table (Fig.2) gives the resistance in Ω per meter. The cable size, cross sectional area (CSA), is usually marked on the outer sheath. The example in Fig.3 shows a three core cable with a CSA of 1.0mm2per conductor. 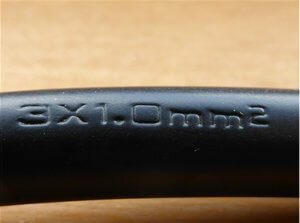 Therefore the maximum earth continuity limit for an appliance fitted with 3m of this cable would be: (0.1 + (3 X 0.0195))Ω = 0.16Ω. Earth continuity readings higher than the (0.1 + R)Ω limit are often due to problems with the test procedure, rather than the appliance itself. The contact resistance between the test lead and appliance case, or the appliance plug and test instrument, can significantly increase the measured resistance. The low current earth test (soft test) is particularly susceptible to the affects of contact resistance because it has less power to break though any oxidation layer on the plug or case. Cleaning the earth pin of the plug with an abrasive paper and making sure the test probe is making a good contact with the metal surface will often reduce the earth continuity reading. Pay particular attention to where the test probe or clip is placed. For example when testing a kettle, putting the test clip on a heating element without breaking through the lime scale will increase the resistance significantly. If possible use the high current continuity test (hard test) to reduce problems with contact resistance. The resistance of the test lead should also be considered. The resistance of the test lead can be measured by connecting it directly to the socket on the tester. 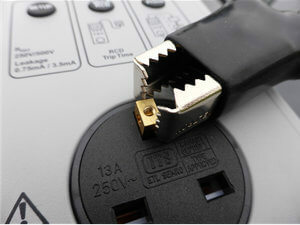 An earth pin from a spare plug makes a useful contact to place the test probe or clip. Some test instruments, such as the Kewtech KT71, Megger PAT150 and Seaward Apollo models allow the resistance of the lead to be nulled. When sending test equipment away to be calibrated, always include the lead to ensure they are calibrated together. The IET Code of Practice describes a situation where a class 1 item may have metal parts that are not directly earthed, but will provide an continuity reading because they are in contact with an earthed metal part. 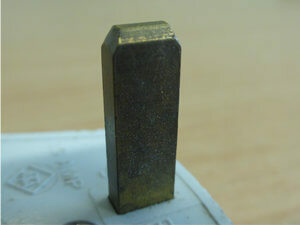 Connecting the test lead to metal that is not directly earthed will usually give a higher reading. For example, the case of a fridge is earthed because it contains the compressor, light, and thermostat etc. The fridge door however does not usually have an earth connection. Placing the test lead on the door will provide an earth reading as it is connected to the earthed case by a metal hinge. In this example the fridge door is in ‘casual or fortuitous contact’ with an earthed metal part. Connecting the test lead to the door is likely to give a higher reading than if connected to the main case of the fridge.